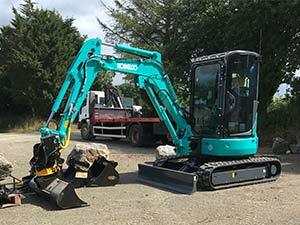 The latest member to the fleet is our new Kobelco SK017sr mini digger. 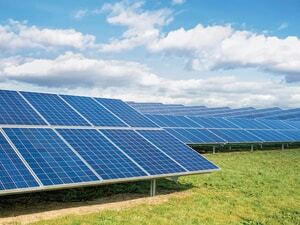 This machine has enabled us to take on smaller projects for customers in the private/domestic sector. At just under 2 ton our mini digger is easily transportable by a 4x4 and trailer. 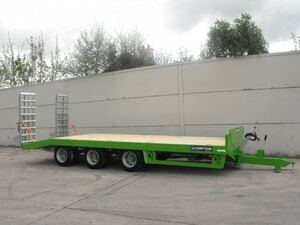 It can reach customers who require operated plant hire in Haverfordwest, Pembrokeshire and Carmarthenshire in good time and with very low delivery costs. The SK17 is a mini digger with a difference! The new mini excavator has expanding and contracting tracks that reduce its width to just 1 metre wide!. And full range of buckets. Short Tail SwingThe combination of side-ditch digging function and short tail radius makes it easy to dig next to walls with a compact operating footprint. 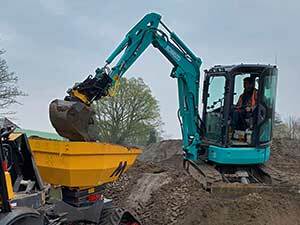 Complimenting our latest mini digger is our mini dumper hire. 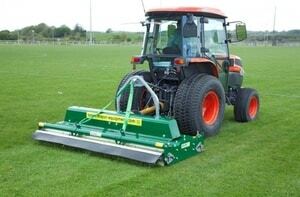 ....and also builders and property owners who are requiring Groundworks services. An overgrown garden. Using the combination of mini excavator and 4x4 pickup with tipping trailer, we were able to reduce ground levels and take muck away of the garden in preparation for excavation of building foundations. Widening of a driveway and re surfacing with type one aggregate for vehicle access. Another example is a garden overgrown and on a steep gradient. As the mini digger could reduce its size, we gained access via a garden path and cleared overgrowth. We then removed a section of bank and stripped soil back. Using a cut a fill method we cut the clay and sub soil to level, starting from a level shelf building up and compacting in layers. Once complete the topsoil was spread level and a separation wall was constructed from rock dug out of bank to complete the garden. Demolition of concrete garden walls and a garden extension with flower beds and block paving. 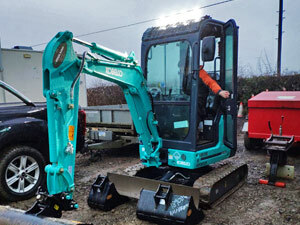 Working as a larger Plant hire and groundworks contractor plus our years of site clearance experience. We can put all of these skills and knowledge into practice in the tightest of spaces to achieve the best results, in a strict budget and in good time.